It's summertime in the city, and I am keeping this popsicle train rolling. Although I will be celebrating Canada Day tomorrow, surely I will still enjoy a hot dog or try to catch part of a baseball game come 4th of July to acknowledge my American roots. 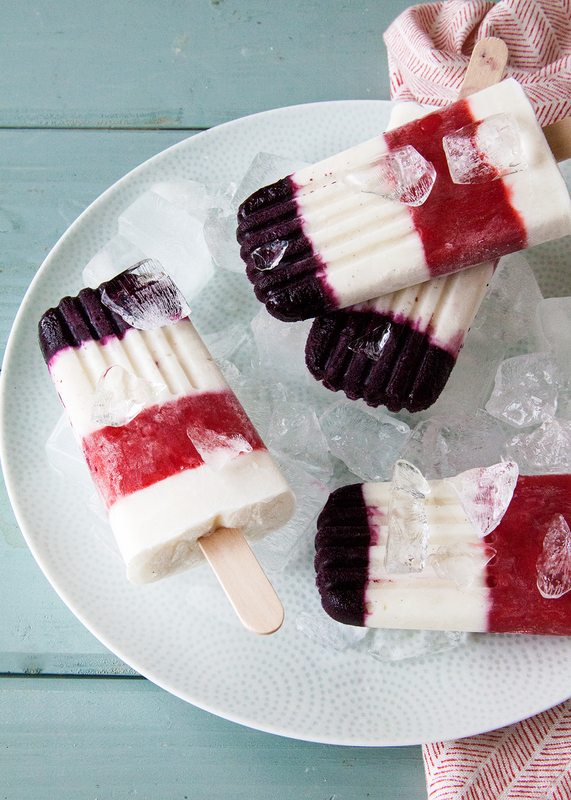 In honor of all the patriotism and celebration this week, I bring you Red, White and Blueberry Popsicles. Those Bomb Pops of our youth just got a whole new look! Make the natural, grown-up version of the striped, frozen treats from fresh berries and yogurt instead artificial dyes and extra sugar. These pops are fruity, creamy and super festive — what more could you ask for?! So be sure to make a batch to celebrate July 4th or to beat the heat on any summer day! I'm sharing all of the instructions over at Brit + Co. Go check it out!